Chi Burger owed Fat Bruce Lee lunch. Chi Burger foolishly bet on himself in a "who can punch harder" contest, and Chi Burger came up on the losing end of the wager. Fat Bruce Lee packs some power. Chi Burger suggested that we try Steingarten LA, and since he was driving, that was where we ended up. We found metered parking on the street in front of the restaurant. Steingarten LA was only 4 months old at the time of this review. We arrived at noon to discover that we were the only customers. We chose a table on the rear patio, and ordered three cheeseburgers all Med-Rare. The menu was heavy on burgers and sausages with burgers leading. That boded well. We have discovered that the burgers have often been better when they are the focus of the menu rather than an afterthought. We skimmed the massive beer and wine menu during the 10 minute wait for our burgers to arrive at the table. The Beef: The beef was a wet-aged, 90:10 Sirloin. This was an all-natural, grass-fed beef from IDB. The burger meat arrived pre-ground, and it was formed into 8-ounce patties each morning. These burgers were wonderfully beefy and juicy. The Sirloin delivered a bite, which was lush with steak, blood, and mineral flavors. The beef was absolutely top notch. It had only a mild scent of aging, and there was no trace of aging in the bite. I spoke with Chef Ricardo Morales, and he indicated that he had started off with dry-aged beef. Sadly, his clientele did not respond favorably to the strong flavor. The wet-aged beef was delicious...Chef Morales was victorious in his compromise. The Seasoning: No seasoning was detected within the burger patties. The exterior of the patties was perfectly seasoned with salt and pepper. This seasoning combined with the blood and juices of the ground Sirloin to deliver a high-quality, luxurious flavor. 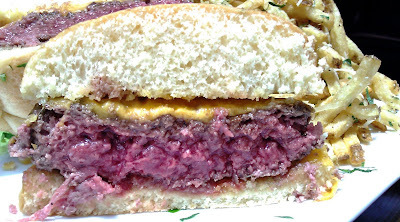 The Sear: The burgers were cooked on a moderately hot gas grill. A proper Malliard sear was not developed. Considering the thickness and quality of these cheeseburgers, a hearty sear would have served to push the really, really good burger into "excellent burger" territory. The Preparation: The beef was delivered pre-ground at a medium setting. 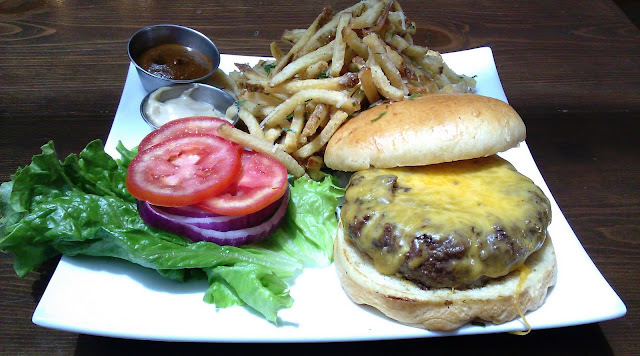 The burgers was formed by hand each morning and periodically thereafter, as needed. The burgers were packed loosely and handled with care. As a result, the bite was very juicy and tender. Considering that the burger was only 10% fat, it was difficult to deliver such a sumptuous bite. Chef Morales' Cordon Bleu of Pasadena training really paid off. Our requests for Med-Rare were executed flawlessly. We all went with the Cheddar. The Cheddar was medium sharp and exceptionally creamy. The cheese added just enough fat to balance the lean beef. Additionally, it provided some umami notes to the beefy flavor profile. The Bun: The bun at Steingarten LA was delivered fresh daily by Wheatland Baking, Inc. of Sun Valley, CA. The bun was a major distraction from the delicious beef. The bun was overly dense to the point where it resembled a semi-sweet, yeasty pound cake. The bun competently absorbed the copious juices from the beef, but this did not minimize the impact of the bread. The bite started with the sweet bun, then the focus shifted to the bloody, flavorful Sirloin, and then back to the bun. This was a distraction. This was also the 4th bun supplier that Chef Morales had tried. We suggested that Ca' d'Oro, Melrose Bakery, or BreadBar would provide buns that better matched the beef. 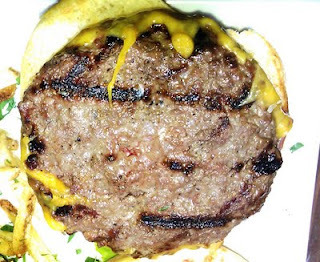 The bun was also weakly toasted on the griddle, so that it did not contribute crunch to the bite. 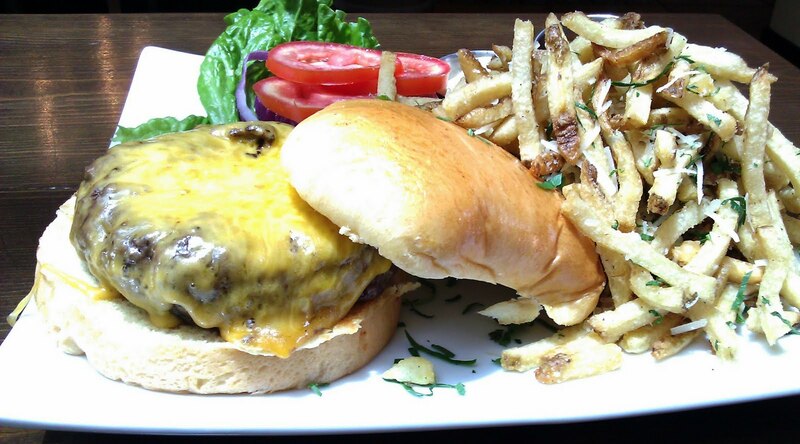 We look forward to trying this burger again once the bun situation has been sorted out. The Meat To Bun Ratio: The bready, dense bun was a little too much for the juicy beef. The Fries: The fries were cut from the same cultivar of potato as used by In 'N' Out...Kennebec. Chi Burger noted that these fries were what In 'N' Out could serve if they cooked them properly. In the case of Steingarten LA, the skinny fries were cut in-house, par-cooked, and dried prior to cooking in canola oil (soy oil upon request). The peel-on fries were delicious and perfectly seasoned. The Parmesan fries were even better. It was difficult not to fill up on fries. The Toppings: Steingarten LA offered a range of sauces. The Curry Tomato tasted like the Currywursts that I grew to love as a kid when I visited my grandmothers in Berlin. The Steingarten Mustard Sauce was also excellent...sort of a creamy Dijon aioli. The Romaine lettuce was fresh and crisp, and the juicy tomato slices were delicately salted to make the flavor pop. The Value: It was $12 for a Create your own Burger, and $1 more for cheese. Each meal came with a generous portion of fries, and not even Fat Bruce Lee was able to clean his plate. The value was good at Steingarten LA. The beef at Steingarten LA was remarkable. The young chef was clearly competent and enthusiastic about his craft. The sole detractors from this burger were easily remedied. This was a delicious burger with a few minor blemishes. I do plan on returning to sample some of the sausages in addition to the evolving burgers at this new establishment. They have the fundamentals down! Burger Review : Really delicious beef and fries at a good price. love the food and the atmosphere.